In part of the Clunie Hotel building, specifically at 811 K St., the Orpheum vaudeville circuit played legitimate acts in the 1,326 seat Clunie Theatre since its opening in 1885. Such great performers as Maude Adams, George M. Cohan and the entire Barrymore family were presented in person. 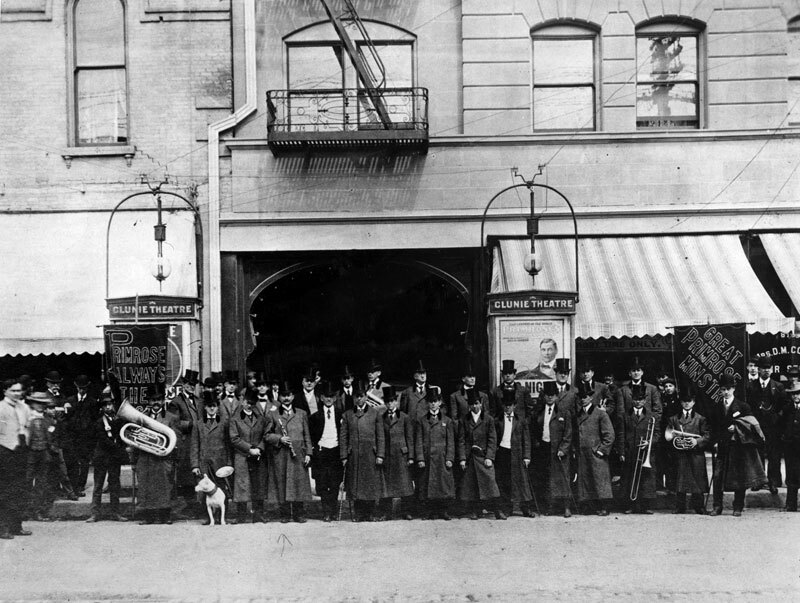 The famous Great Primrose’s Minstrels are seen in front of the theatre, stopping as a part of their 1898 tour of the US. In June of 1915, D.W. Griffith’s screen epic The Clansman later to be re-titled The Birth of a Nation, had an extensive first run engagement, and movies were here to stay. In 1923, Hale’s department store was enlarged on the first floor of the Clunie Hotel and the theatre was torn out to make room for the expansion. Fire destroyed most of the hotel in 1986, and it was demolished to make way for the “Darth Vader” (Renaissance Tower) building.